If you’re reading this story from the back seat of car, there’s a good chance you’re not wearing a seat belt. 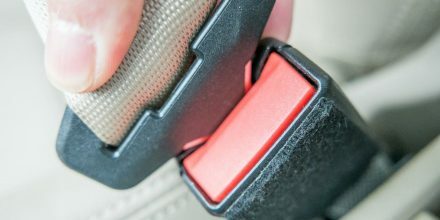 A recent survey by the Insurance Institute for Highway Safety, or IIHS, found that 28 percent of respondents don’t always click a seat belt when they’re in the back of a car. The most common reason for not buckling up in the back, according to the 1,172 survey respondents, is that there is no need, because the rear seat is safer than the front. But that’s not always true. “Adults have gotten the message that it’s safer for kids to ride in the back seat properly restrained, but when it comes to their own safety, there is a common misperception that buckling up is optional,” said Jessica Jermakian, a senior research engineer at IIHS. “While the rear seat retains its reputation as the safest part of the car, in reality that is now the front seat for adults and older teenagers,” said Kristy Arbogast, director of engineering at the Center for Injury Research and Prevention at Children’s Hospital of Philadelphia.